The entire Los Angeles basin and beyond, from the hills of downtown L.A. to the beaches of Catalina Island, is the ancestral homeland of the Tongva indigenous people. Today, artist River Garza is one of less than 2,000 remaining Tongvan descendants. New to printmaking, Garza took Self-Help Graphics & Art’s 2018 Annual Print Fair by storm with a tribute to the maritime culture of his indigenous roots. In Breath of The Ocean, Garza utilizes wordplay and imagery simultaneously, knowing that they are unfamiliar to common eye and ear. “It’s so foreign to so many people to see indigenous words from the area,” said Garza. 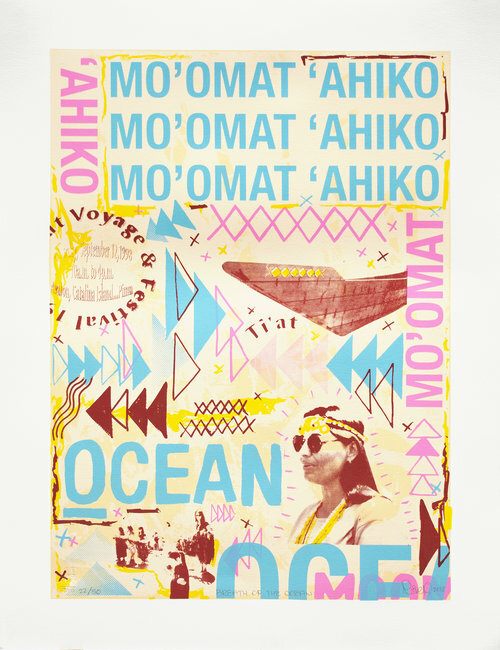 “Mo’omat ‘Ahiko”, “Breath of the Ocean” in English, is written multiple times on the print. It is reference to the woman who is the beloved ti’at, or matriarch, of his tribe. The repetition is used as tool by Garza to invoke a sense of sovereignty amongst the community. Despite the fact that the Tongva people primarily communicate with oral languages, Garza chose to have it written, as Western conventions for communication allow for broader audiences to be a part of the conversation. For the past 30 years Tongva people have been reviving culture and practices that the community had departed from over 100 years ago. This idea traces back to the native nation’s fight to reclaim their land, which led to the Indian Religious Freedom Act in 1978. Through the ‘80s and ‘90s, tribes across the country continued the decolonization process by reclaiming songs, art, and language. The woman featured on the bottom-right corner of Breath of The Ocean is Garza’s aunt, Cindi Alvitre, who was fundamental in the reclamation of maritime practices that had long been suppressed due to government implications and forced genocide. Garza credits Alvitre for grounding him in his tradition and culture from a young age. Today, the redwood-sewn watercraft Tongva ti’at, regularly cuts through local ocean waters as part of Tongva tradition. Along with descents of the Chumash, indigenous to Santa Barbara county, paddlers from the Tongva community sail in voyages to the Catalina Islands of the coast of Southern California. Tribal members envision these canoes as key symbols of native identity and cultural resurgence. Garza in the process of making Breath of The Ocean for the 45th Annual Print Fair and Exhibition. “There’s a cliche of sorts surrounding Native art. There are certain tribes -- particularly from the southwest and the Dakotas -- that have become the quintessential formation of Native art. ", said Garza. In Breath of The Ocean, he showcases his native art-form. While Garza does look to many indigenous artists for inspiration, the self-taught artist seeks to branch-out from the stigmas attached to his art-form and elevate his voice as a person who is indigenous to Los Angeles. This fine art serigraph is on display in the SHG gallery space as part of the Print Fair Exhibition through August 3rd, inviting all to explore the experiences of the indigenous Tongva in Los Angeles.